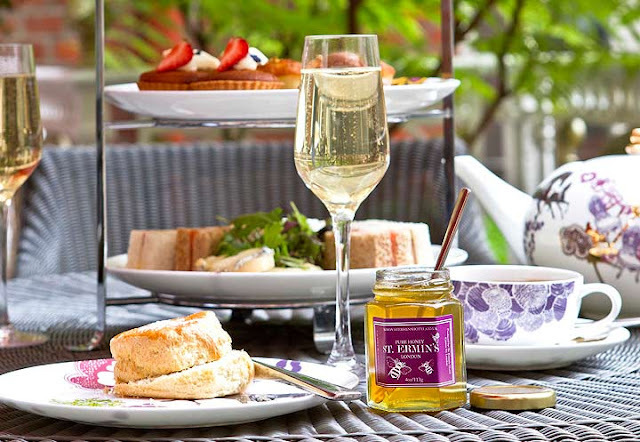 To celebrate the overwhelming success of St. Ermin’s’ 200,000 rooftop bees, they have created a Honey Afternoon Tea. St. Ermin’s’ Honey Afternoon Tea includes honey and caramel mousse with crunchy honeycomb topping; honey Bakewell tart; scones with strawberry jam, clotted cream and honey; lemon and honey polenta cake; goats’ cheese and honey mille-feuille plus a selection of finger sandwiches and a 1.5oz jar of St Ermin’s’ honey to take home. St. Ermin’s’ Honey Afternoon Tea will be served daily in the St. Ermin's' Library or Lobby between 1pm and 5pm.